Karen graduated from Duncan of Jordanstone College of Art with a BA Hons degree and completed a year of post graduate study. 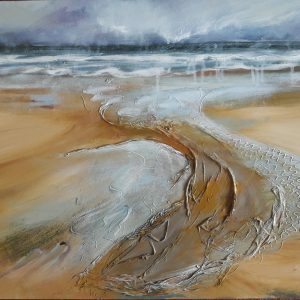 She lives and works in East Lothian inspired by the landscape. 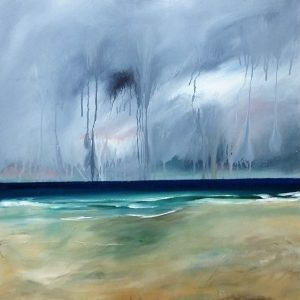 “My primary interest is in producing mixed media images inspired by the outdoors; landscape and elements. Using sketches from location I construct an image which represents my emotional response to time and place. Repeated journeys, walking, cycling, running and climbing form the basis of the images which can be familiar and at the same time different because of light, weather, sound and temperature. The paintings are highly textured using layers of acrylic paint which is scratched back to reveal flecks of colour from the layers below. Found objects and words complete the work.